A screen saver is an animated image that appears onscreen after a fixed period when your Mac doesn’t detect any keyboard, trackpad, or mouse activity. When selecting a screen saver, you can choose an image to display and the amount of time to wait before the screen saver starts. For an eco-friendlier alternative to using the screen saver, check out the Energy Saver setting. 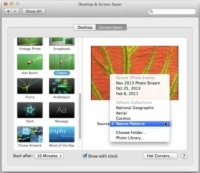 1Choose Command→System Preferences from the Finder menu and click the Desktop & Screen Saver icon. Or you can Control-click the System Preferences icon on the Dock and choose Desktop & Screen Saver from the pop-up menu. 2Click the Screen Saver tab to display the Screen Saver preferences pane, and then click one of the screen saver styles shown in the left column. The first 14 styles all use photos and display a Source menu under the preview image. 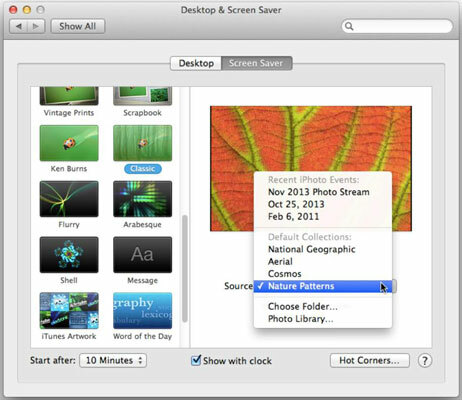 Open the pop-up Source menu and select from Recent iPhoto Events, Default Collections (which include some fabulous National Geographic photos), a folder, or photo library, as shown in the figure. Check Shuffle Slide Order (hidden under the pop-up menu in the figure) to randomly display the images in the chosen event, collection, or library. Flurry, Arabesque, and Shell display luminous, colorful, moving shapes. Message displays something you write, such as an inspirational phrase or reminder. iTunes Artwork displays a collage of album covers from your iTunes collection. Word of the Day shows a word selected from the dictionary you choose in the Screen Saver Options menu. Random picks a different screen saver image every time the screen saver starts. After your randomly chosen screen saver starts, that same animated image appears until you press a key to turn off the screen saver. 3Open the Start After pop-up menu to specify an amount of time to wait before your screen saver starts. Opting for a short amount of time can mean the screen saver starts while you’re reading a web page or document, so you might have to experiment a bit to find the best time for you. (Optional) Select the Show with Clock check box to display the time with your screen saver. Click the Hot Corners button. Open one (or each) of the four pop-up menus and choose a command that your Mac will carry out when you move your pointer to the specified corner, as shown in Figure 6-4. Two common uses for a hot corner are to turn on the screen saver, or to put your Mac’s display to sleep to save energy. You can define multiple hot corners to do the same task, such as defining the two top corners to start the screen saver and the two bottom corners to put the display to sleep. Click OK to close the Active Screen Corners dialog. 5Click the Close button in the Desktop & Screen Saver preferences pane. You can customize the layout of the System Preferences window by choosing View→Customize. Clear the check box next to the items you don’t want to see. You still see all the preferences in the Show All menu and the System Preferences menu accessed from the Dock.